FortiBridge-2001F appliances ensure mission-critical network continuity by automatically re-routing your network traffic around inline security devices in the event of a power failure or system fault. The FortiBridge appliance operates in transparent mode during normal operation and automatically bridges network traffic to bypass a system failure or power outage to ensure mission critical network continuity. The FortiBridge-2001F appliance provides two GbE fiber interfaces with LC connectors and two GbE SPF interfaces for fail-to-wire bypass protection. The 1-RU appliance form factor allows you to add bypass functionality to any existing inline security system, including FortiGate multi-threat security systems. You are faced with the challenge of securing your network while also ensuring that it is always available. This could mean that you are forced to choose network availability over ensuring that all traffic is inspected for malicious activity. You are already using high availability features of the security infrastructure, where a system fails over to either an active or standby unit. While this can reduce the risk of a network outage and still providing security services, to further reduce the risk of a network outage, additional steps have to be taken. To preserve availability in the event of a power failure or a device malfunction, bypassing the device altogether with a fail-to-wire solution can ensure network continuity at times when security cannot be provided. 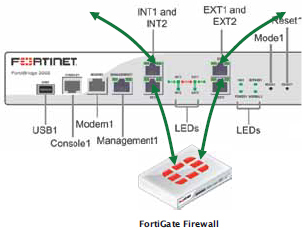 In normal operation of the FortiBridge, data flows from the Internal ports of the FortiBridge to the Internal port of the FortiGate unit. 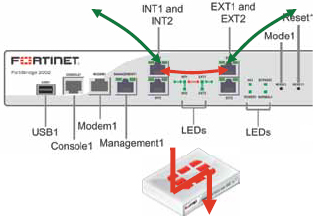 The traffic flows from the FortiGate unit through the External ports of the FortiBridge unit to the external network. FortiBridge enters Bypass Mode when traffic failure is detected or power loss occurs (zero power fail open). The INT2 and EXT2 ports are directly connected mechanically. Traffic between Internal and External interfaces continues to flow. Fail-to-Wire Bypass Maximizes network uptime by automatically re-routing traffic in the event of a power outage or any other type of event that would cause an in line security device to degrade the availability of the network segment. Standalone 1-RU appliance Enables you to add bypass functionality to any existing in line security system, including FortiGate® consolidated security systems. Remote configuration and monitoring Enables you to monitor and control the bypass status of network segments remotely, with the ability to view mode of operation, manually switch the appliance into bypass or normal operation mode, and configure thresholds for automatic bypass fail-to-wire.